The pong of a warm harmonic sounds and sustains. Like a lone, hanging chime, it focuses the listener’s attention. Then, four descending notes step down a slow arpeggio, triggering a hesitant whisper of a treble note that wavers on the edge, before a triplet of bass notes tumble down into the first full but effortless chords, like the surrender heard in a tension-releasing exhalation. Languid, lovely, evocative, this is a 3-minute melt into a sumptuous sofa, and the sonic equivalent of isolated pools of low light playing off facets of cut crystal and opulent aperitif, close sensuous voices, soft laughter bittersweet with memory at the end of an evening. A warm, layered and very human scene painted entirely with one acoustic guitar drenched with resonant chords, clear and unhurried melody lines, and shadowy blue bass notes that rise or fall in pitch or pace like a melancholy pulse. An exquisite piece of music played on an exquisite guitar, exquisitely. Here is a slightly faster, live rendition you can listen to, while you read the rest of the review. “Under an Indigo Sky” is Laurence Juber’s 23rd album, if you only count the ones with his name on the cover. His career has gone from arena rock, to Hollywood soundtrack specialist, to A List session player. Although millions have heard him on electric guitar as a member of Paul McCartney and Wings, or playing the action theme behind the exploits of James Bond, it is his true musical love, solo fingerstyle steel string guitar, which has veterans of the guitar world proclaiming him one the best guitarists of his or any generation. The fourteen cuts on this album offer a fine assortment of the kinds of music he has put out during the twenty-first century. Here is new original music of quintessential Juber and that which shows the influence of his recent forays into jazz music. And here are new arrangements of pop and bluesy jazz standards reaching all the way back to between the World Wars. Each of them recorded and mixed with expert precision, making the spontaneity and dynamics of the performances all that much more spirited. Some were conceived to capture the flavor of the original version, like the righteous rendition of Del Shannon’s Runaway, and the jaw-dropping All the Things You Are, which glides in on a slow swing syncopation before kicking into overdrive with a lively counterpoint running nonstop in the bass, under the single note melody line, like something out of Bach. Other arrangements are more stylized, like his creative and animated take on Paul Simon’s Mrs. Robinson, and some start out true to the source material only to evolve toward in-the-moment improvisation, as in Juber’s version of “As Time Goes By,” which breaks into a bendy blues outro. Every selection was arranged in the Celtic DADGAD tuning – a first for a Juber record. A true master of the guitar, Juber often employs DADGAD, but turns to keys like Bb or Ab, way outside of the usual D or G Major most people resort to when arranging in DADGAD. And the arrangements are so varied on this record that I would have never thought they were all performed using the same tuning. While non-musicians may never fully understand the degree of difficulty involved in a solo guitarist realizing such multi-part arrangements of well-known melodies, one thing is obvious. This is truly beautiful music. After nearly 50 years as a recording artist, LJ continues to look for new ways of exploration and artistic expression. “I wanted a bluesy semi – late night mood” is how he put it, when I asked the guitarist why the specific selections were made. “Some tunes I’ve been playing in concert. Others are favorites from way back.” While there are a fair amount of upbeat numbers, most are on the mellow side. Many allowed him to stretch out beyond the intricate, written-out arrangements that earned him so much reverence. After a series of records focusing on either original, contemporary fingerstyle pieces or exhilarating solo arrangements of well-loved pop tunes by the Beatles, and Wings, Juber turned his ample prowess toward the even more challenging harmonic structures of jazz. He did a solo guitar record of Harold Alren songs (If I Only Had a Brain, Stormy Weather, It’s Only a Paper Moon) followed by an acrobatic arrangement of the Pink Panther Theme, by far the best track on the compilation record “Henri Mancini: Pink Guitar,” which earned him his second Grammy. I even saw him tearing up the strings of a candy apple red Gibson Les Paul when he took center stage for a night with the surviving members of Les Paul’s band. 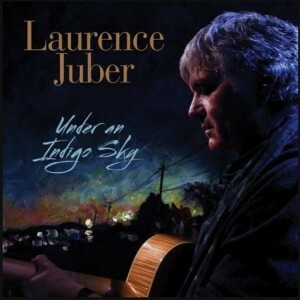 “Under an Indigo Sky” brings various music styles together, but the arrangements of standards and originals all benefit from his fresh, jazz-y sensibilities. Just when I thought there was no reason for anyone to redo Autumn Leaves after Chet Baker’s sublime renditions, here comes Laurence Juber to breathe new life into the embers with a bluesy slant to jazz that would have earned him a deepened-brow nod of approval from the likes of George Barnes. And the Jubers’ original co-composition Juno has such a timeless, swingin’ lilt to it that Barnes might have offered one of his colorful expletives in exuberant appreciation. It comes off like a classic jazz standard one has just now discovered. Barnes and Juber have several things in common. Both men mastered their instrument at an early age, as well as being superb and meticulous arrangers, and their artistry continued to improve like fine wine as they grew older. Both spent considerable time as top gun session men for an astonishing array of popular music, sometimes greatly outside their personal musical tastes. And both displayed the most refined and impressive musicianship when it came time for their own name to appear on the marquis. Other Juber compositions on the record include the title track, which brings its own noir feeling of mystery but in a contemporary fingerstyle vein. Twilight in Montreal on the other hand has a spicy, sultry feel and a funky urban beat in its bass. And The Other Side of Midnight has a slinky shimmy to it, and a down and dirty bluesy quality that would fit the rolling credits of a gritty detective drama. While the video above actually features his older, mahogany signature edition, this one shows the actual guitar used for the record. Here is Laurence Juber tossing off a version of The Other Side of Midnight as part of a promotional piece he did for the album. As nice as that might sound, the audio quality of the CD is superior. Juber used a pair of Schoeps CMC5 mics in the ORTF configuration, which has the mics 17 cm apart, pointing in opposite directions, to simulate the hearing pattern of human ear, and he recorded the guitar through Neve mic pre-amps. “The big difference is that it was mixed to tape by Al Schmitt at Capitol and mastered at 176.4K/24bit sample rate with a subsequent downsampling for the CD. If it’s played back on a HDCD compatible system, you can turn off the +5db volume boost. The vinyl release was direct metal mastered from the hi-rez source with no EQ or compression.” Schmitt has won 19 Grammy Awards to date, including the Lifetime Achievement Award in 2006. On the CD, the slightest string vibration, creak of the guitar’s hide glue joints, or wave of Juber’s “virtual whammy bar” technique used to coax out every drop of resonance is heard clearly and in three dimensions. The vinyl version must be breathtaking. The other cuts on “Under an Indigo Sky” are Nobody Does It Better (The Spy Who Loved Me,) Raining in My Heart, Don’t Let Me Be Misunderstood, and Charlie Chaplin’s Smile. And each one of them so well-rendered as to be definitive versions, at least as far as solo acoustic guitar renditions may go. At first, I wasn’t sure how well these collected tunes would work together on a single disc, given their various styles and historical points of origin. A week into it and it is already one of my favorite guitar albums in any genre. Of course, he knew I was likely to agree. And that is one man’s word on…. And you can see him live in concert at any of the following venues – check his webiste for updates!